Desk Sergeant Charlie Hills was by nature a two-fingered typist, but sometimes, when the muse was upon him and there were words to be produced that contained a lot of a’s, e’s, and s’s, the middle finger of his left hand would join the party. He typed ‘assessment’ with some panache, therefore, but then had to stop and count the s’s, undoing any gains he had made in the time taken. I like Peter Grainger’s D.C. Smith mysteries more with each outing, and The Rags of Time did not disappoint. I have compared Essex Detective Sergeant D.C. Smith to the American character of Columbo before, but I found myself thinking of Michael Connelly’s Harry Bosch this time around. Though different in their environments and methods, the two detectives have much in common. Both are aging masters, and both tend to make enemies among their colleagues because they work a little harder than everybody else. Where other cops are content to connect a few dots and make a frame, these two see more dots and sometimes come out with very different results. They never forget that it’s not enough just to make a case – they need to find the truth, to do justice as much as possible. This time out, Sergeant Smith is contemplating retirement. He’s just returned to work from medical leave, and the department is going through changes. One of his fellow detectives, Wilson, a man who’s been a personal rival and enemy, is on the point of promotion. Smith, who has no noticeable personal vanity, actually manipulates various things to make Wilson look good, and attempts to heal their differences. All that, however, falls to pieces when a dead body is found in a rural field. The victim, a metal “detectorist,” was killed with a blunt object of some kind. Suspicion falls on his fellow detectorists, but Smith is unsatisfied with Wilson’s rush to judgment. He has to step in to correct the man’s mistakes – multiple times. The true trail seems to him to lead to the residents of a nearby friary where, in spite of holy vows, somebody is telling lies. D.C. Smith is a fascinating character, a mystery to his co-workers, and even a bit of a mystery to the reader. I like him immensely. I liked this book immensely. I liked the prose immensely. The language is restrained (including little profanity), but often witty, and there’s really nothing to object to. Even issues of faith are treated with respect. 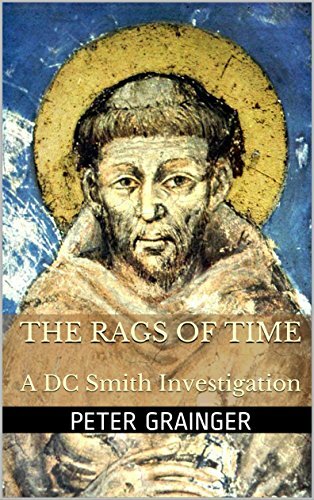 I highly recommend The Rags of Time and the whole series.